Finding a place that serves Mediterranean food may seem quite a general theme but we all seem to understand what it means. This cuisine is from the vast areas that are adjacent to the Mediterranean Sea although it now spans far wider than that. Turkish, Italian, Spanish and Greek restaurants often offer their local and Mediterranean dishes, even parts of north Africa are also considered Mediterranean. 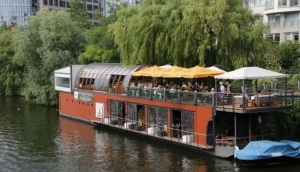 Promo café and restaurant in Moabit is a lovely spot far enough out of the city, but close enough to the river Spree to spend a few hours at breakfast, lunch or dinner..